Move into your new Home Before the Holidays and brighten others’ lives, too! Moving into a new home during the holiday season takes on special meaning for many renters. You’ll be enjoying the relaxation of a warm and inviting space during winter’s chill, celebrating the holidays of joy and light no matter how dark it is outside, and ringing in the New Year in your fantastic new space! Now your decision to rent a new apartment home from BRG Apartments can do even more. During our Home Before the Holidays event, BRG will donate $50 to Fisher House, a charity supporting military and veterans families, with every new apartment rented. So if you’re ready to join us, we’re ready to welcome you—and to help you share the season of giving with those less fortunate. Move in before Jan. 11, 2019! The holidays can be a hectic time of year, so we’ve made participating in the BRG Apartments Home Before the Holidays event easy! Just sign a 12-month lease and take occupancy no later than Jan. 11, 2019, and your rental will help another family in need. Why is moving now the best time of year? Your dream apartment may catch the eye of fewer prospective renters! Because there are fewer people looking for apartment homes this time of year, finding the right apartment may not be as difficult—and when you do, you’ll have better likelihood of securing your rental agreement quickly and easily. A beautiful new home is a gift that keeps on giving. Your home should be a comfortable, safe space that supports your dreams. Your new BRG apartment can bring you closer to your work, school, shopping or needed services, helping to ease your commute—or perhaps bring you closer to family and friends. Especially during winter, finding an apartment that’s convenient to the things you value most, and that offers community or fitness amenities to help keep you healthy and engaged with others, is a great gift to yourself. You can start the New Year off right. There’s a certain magic to being in a new apartment home to start off a new year, and by participating in BRG Apartments’ Home Before the Holiday event, you can ring in 2019 knowing that you’ve helped another family, as well. Fisher House Foundation builds comfort homes where military & veterans families can stay free of charge, while a loved one is in the hospital. 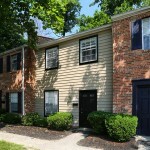 These homes are located at military and VA medical centers around the world, including Cincinnati and Dayton, OH. Families staying at Fisher Houses share a common kitchen, laundry facilities, a warm dining room and an inviting living room. Since inception, the program has saved military and veterans’ families an estimated $407 million in out of pocket costs for lodging and transportation.